With its exciting opening this fall, Houston's Market Square promises to live up to the community's early vision of the area as a magnet destination that would increase tourism and make downtown Houston more livable and vibrant. At lunchtime -and throughout the day- Houston Market Square, in the center of Downtown Houston's Historic District, now bustles with activity as visitors come to enjoy a new Greek café, performances, shaded seating, a water feature, and bike racks. A large dog run also attracts residents who have quickly adopted the park as their main community space. Houston's Market Square is but one of PPS Parks and Downtown projects which have recently opened to great fanfare: Pittsburgh's Market Square also recently re-opened, drawing crowds back to the city's core. 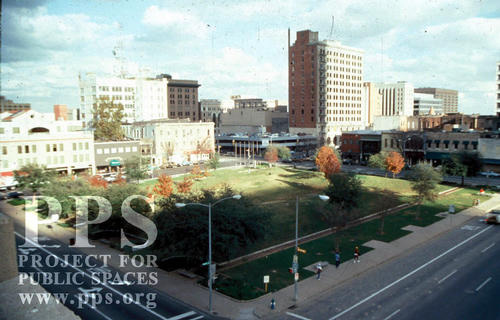 PPS' involvement in Houston's Discovery Green and Detroit's Campus Martius have spurred Downtown Development in both cities. It's almost impossible to think that just a few years ago this same square at the center of Houston's Historic District was once described as "lifeless" and "creepy" and was featured in PPS' Hall of Shame. 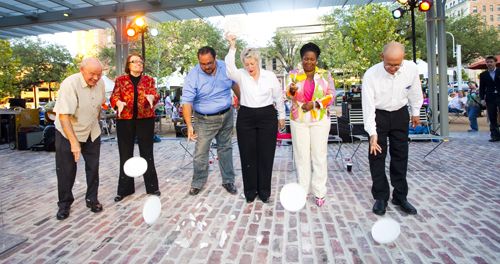 In 2007, Project for Public Spaces was called on to guide the future development of Houston's Market Square Park. PPS began a community-driven process to gather information on the neighborhood and on the existing conditions of Market Square itself. PPS conducted a visioning process that resulted in a concept plan that was to make Market Square Park a place that would anchor the district and spur further revitalization. As part of the final report, PPS also outlined dynamic programming for the park, including rotating events such as farmers markets and holiday markets, movies, exercise classes, a library kiosk, as well as play areas for children. 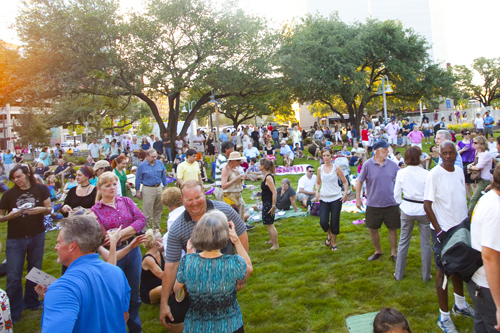 Creating a vibrant livable downtown for Houston has been an ongoing effort for the city, with PPS as a partner on several parks and square including Discovery Green and Emancipation Park. 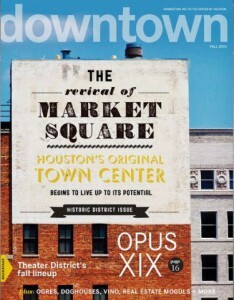 According to this article in Houston Downtown Magazine, Houston's new Market Square is part of a "key tactic" of “giving modern purpose to historic spaces ... for the entire Historic District’s renaissance over the past 20-plus years.” Two issues central to the project were how to acknowledge the historic importance of the site as Houston’s first public space (and the site of several City Halls until 1960), and how to accommodate a number of site-specific artworks that were created as part of the previous design. PPS worked with a number of those artists to incorporate their works (and in some cases update the works) into the new square and the designer (Lauren Griffith Associates) took the footprint of the City Hall for the site of the main lawn. What do you like best about the Square? What would you do to improve it? Do you have any stories to share from before or after its reopening?